Once you’ve gotten familiar with using an all-in-one style device, it can be tough to go back to less cohesive equipment. At least, if you ended up finding the right device to begin with. Because contrary to what you might think, not every all-in-one printer is equal. Sure, they’ll all let you scan and copy documents. But what kind of scanning and copying features are available to make things run a little smoother? Different printers get made for different types of people. Not everybody is working from a giant office environment, and not everybody is running a small business. Like you would expect from an all-in-one printer, the OfficeJet 5260 is capable of scanning, copying, faxing, and printing. 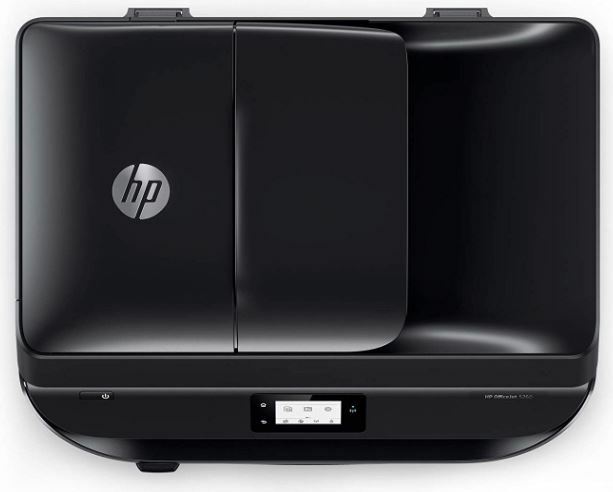 One of the things HP has been careful to do over the past few years is to evenly develop those features, so that the supporting features in their OfficeJet series don’t feel as though they’re greatly lagging behind the print features. These devices are supposed to be genuine replacements for three or four other separate devices. But they can only be replacements if they can work independently on a level that’s up to the levels of quality and tasks you have in mind for your own print jobs. If you’re someone who needs some specific sets of features, like duplex copying, then you’ll likely find the OfficeJet 5260 goes far to cover all your basic needs. But every printer has its limits. 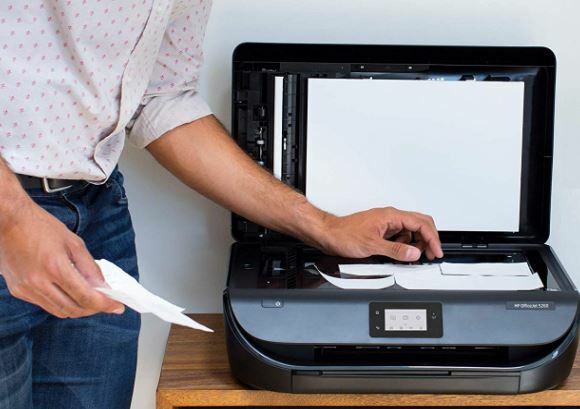 Even the biggest and best printer on the market will ultimately have a finite number of connection options, a finite support for different types of media, and a finite amount of support for throughput. Knowing whether or not a printer like the OfficeJet 5260 will meet your needs really demands that you anticipate your needs. But with that said, the OfficeJet 5260 was pretty clearly made for smaller home-office environments. Similar to many other all-in-one style printers, the OfficeJet 5260 is quite compact. 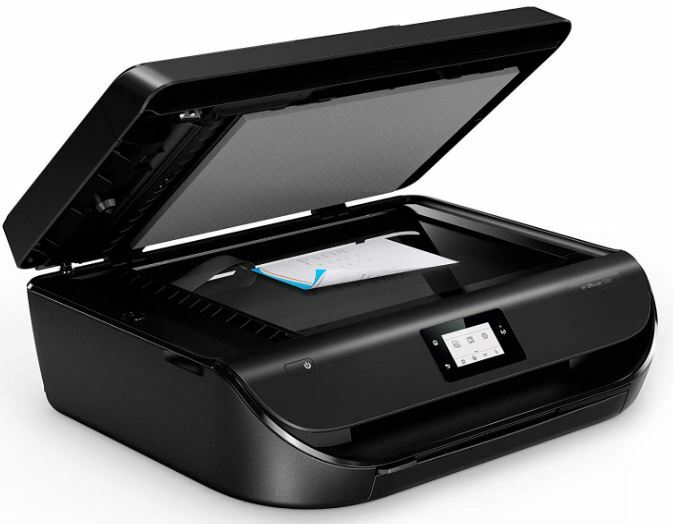 It measures roughly 19.1 x 17.5 x 9.1 inches, which actually makes it one of the slimmest printers in the OfficeJet line. You might find the black exterior pretty bland and formal looking, but the aesthetic is only as inoffensive as similar office equipment tends to be. Since you’re dealing with a relative compact unit, you’ll notice the topside tray has its capacity slightly slimmed down. But in general, its features don’t seem to be hampered by the modest reduction in size. Even the more in-depth scanning and copying abilities remain entirely intact when compared to much larger machines. And that’s something that becomes more transparent as you begin to dive into a closer examination of those features. Some of the most interesting features added to HP features in recent years pertain to the implementation of AI. The general idea is to use some rudimentary AI in order to help speed up a variety of common tasks you might undertake with a printer like this. For someone who’s routinely taking on complex print jobs that need a bunch of different customization options selected, those kind of AI features can be wonderfully helpful. Because even if you’re very familiar with using the OfficeJet 5260, and you know how to access all the various settings, being able to get everything done with the single press of a button can end up saving you a lot of time. However, the type of person who’s interested in a lower throughput device like the OfficeJet 5260 will probably not be doing as many of those highly complex print tasks. And when you’re not trying to print 75 specialized documents in a single pass, these sort of automation settings really aren’t quite as important. But there are actually many time-saving elements inside of this device. For instance, the OfficeJet 5260 was built with a 35-page auto document feeder. That capacity isn’t quite enough of a document feeder for someone to place down an entire novel and walk away, but again, this printer wasn’t exactly made with higher levels of throughput in mind. Within the 35-page limit, the feeder works wonderfully. It draws in paper one sheet at a time, and it isn’t super picky about the placement of the sheets in the tray. That means you probably won’t end up coming back to find the tray has only pulled through half of the sheets you’ve placed. Though if that sort of thing does happen, you can get alerted to it through the app. Though duplex printing has become so common that it’s hardly worth noticing anymore, the OfficeJet 5250 does indeed provide formidable duplex printing. That duplex printing capacity is not totally unrelated to its ability to print borderless photos, albeit only when those photos are using standard print sized sheets. One thing that’s really important to note about this printer is that the HP 5260 includes two years of free delivered ink. That ink comes delivered through their Instant Ink program. Admittedly, this is pretty much just a marketing ploy to get you familiar with using their ink replacement service. That way, when your two years of service are up, you’ll be more likely to sign up for a paid subscription. But it’s a lot of free ink, so it’s hard to begrudge the opportunity. Two years’ worth of ink isn’t exactly very descriptive, now is it? It’s probably important to keep in mind that the two-year total is based on the assumption that you print 100 pages per month. If you greatly exceed that amount, you’ll need to supplement your ink in other ways. Conversely, if you don’t come close to hitting 100 pages per month, then you’ll end up with more than two years’ worth of ink during your free subscription. Bigger companies like HP have the resources available to create some really compelling apps alongside their hardware. And the HP Smart app is nothing if not compelling. From the moment you first install it on your smartphone, the app makes setting up the printer about as simple as can be. Once the setup process is completed, the app continues to be useful as a conduit to help you wirelessly control your printer. That includes scanning documents with your camera, printing straight from the cloud, or copying content right off social media. Naturally, cloud support includes all the big names, including Google Drive, Dropbox, iCloud, and so forth. When you’re not controlling it wirelessly, the OfficeJet 5260 can be configured with the help of an onscreen display. The display is 2.2”, which actually makes it fairly small. You might want to notice the screen is monochrome screen, not filled with the sort of rich colors you can find on higher end printers. But even though you don’t have the kind of high-contrast display that’s typical of higher end machines, this is still a fully effective touchscreen. With very little preparation, it can help you navigate through a variety of different settings with ease. And because the touchscreen interface actually mirrors the smartphone interface in more than a superficial manner, learning to control one really helps you master the other. 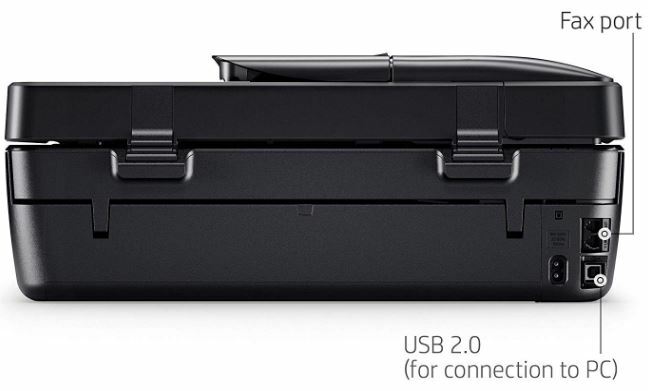 The OfficeJet 5260 allows you to connect with either Bluetooth or with Wi-Fi. And not just 2.4G Wi-Fi, but also make a connection on the 5G band. 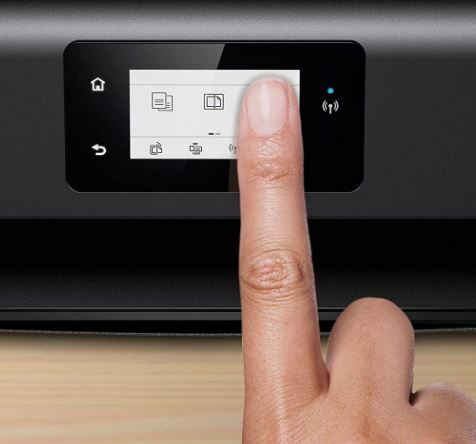 That’s means this printer delivers basically limitless options for your wireless connectivity. Smartphones, tablets, routers, laptops, and basically any other wireless device should have no issue making a connection. Unfortunately for people who are looking for hard wired connections, it is worth noting that this printer lacks Ethernet networking. Given that you have access to both Wi-Fi and Bluetooth, that shouldn’t be a problem for most people in most circumstances. But there’s always someone who’s trying to print documents from the bottom of a bunker, or the backside of an office where the Wi-Fi connection just doesn’t quite reach. For those people, the 5260 has nothing to offer. When it comes to media support, you’ll find the OfficeJet 5260 can feed through basically any kind of paper you might want to stick inside. That includes smaller photo papers in the 4” x 6” range, and it includes larger #10 envelopes. You’ll find equal support for business paper, legal paper, glossy paper, photo paper, and so forth. The OfficeJet 5260 includes some starter ink cartridges, a power cord, a reference guide, and a certificate for two years of free ink. You can use that certificate to register for the rest of your ink through their app, or through the HP website. Additionally, the 5260 Wireless All in One Printer includes a two-year warranty. And if you register your printer with HP, they’ll actually extend that warranty out by another year. Not bad! Additionally, HP provides 24/7 tech support. For the most part, you probably shouldn’t end up needing to interact with support. Especially since the HP Smart app is actually pretty good at helping you narrow down and knock out issues. But if you do need help, it’s nice to know the option is there. 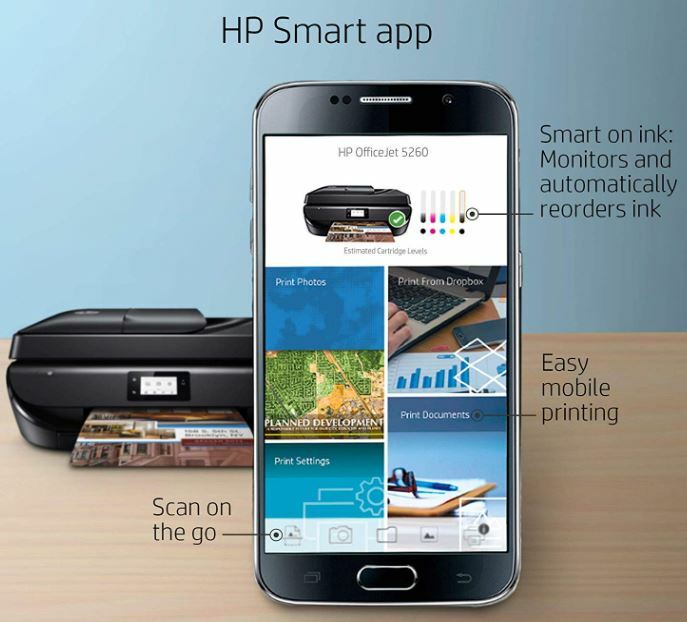 Who Should Choose the OfficeJet 5260 Wireless All-in-One Printer? The HP OfficeJet 5260 Wireless All-in-One Printer is a good choice for a number of different people. For starters, it’s probably the right pick for someone who’s in a smaller throughput environment, like an office with between one and four people who are printing on a regular basis. 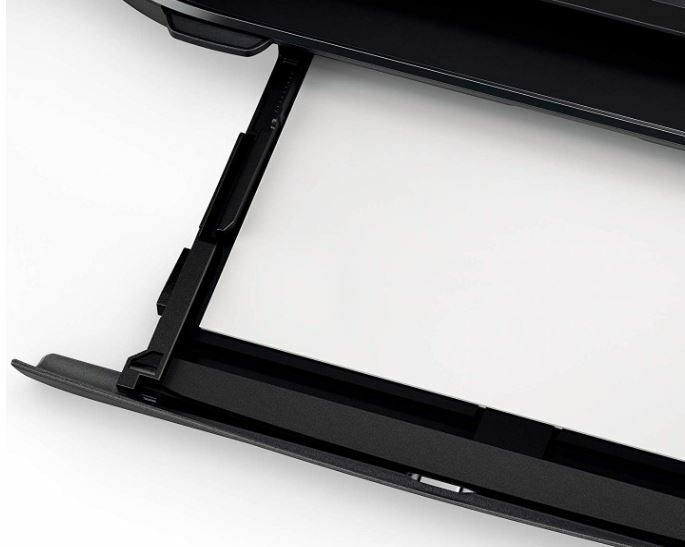 As you’ve certainly noticed, the OfficeJet 5260 isn’t restricted to prints. Its fax, scanning, and copy features are actually pretty impressive as well. And the ability to make customized smart shortcut macros can really help speed-along a number of different tasks. 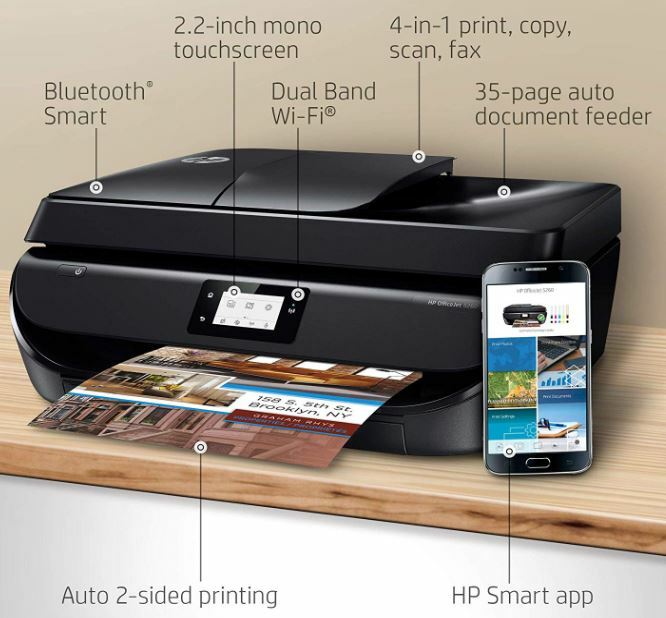 Along with its above-average wireless connectivity options, it’s easy to see a number of different reasons to recommend this printer. Sadly, people who are looking for hard wired Ethernet connections won’t find the options they’re looking for here. But for people who don’t desperately rely on hard wired connections, the 5260 is worth checking out.